Our natural resources are strengthened through diversity, our organizations and partnerships, too, demonstrate strength through diversity and inclusion. Despite this understanding, research shows that many environmental NGOs, foundations, governmental agencies and academic departments have barriers to developing cultures inclusive of diversity. 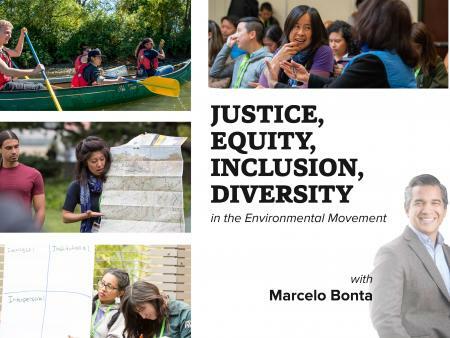 In his keynote presentation, Marcelo Bonta will provide context and inspiration for diversity, equity, and inclusion (DEI) in the environmental movement, discuss the critical need, highlight successful efforts and approaches, and share what is needed to create a successful and relevant environmental movement now and far into the future. Bonta is a thought leader in the environmental movement. He brings almost two decades of experience, facilitating individual, organizational, and systemic DEI change processes, through process consulting, coaching, advising, trainings, leadership development programs, organizational strategies, insightful and groundbreaking articles. This program is accompanied by the workshop “Pursuing Equity and Inclusion within Environmental Organizations” For more information, click here.